2019 Kawasaki KLX450R. Picture credits - Kawasaki. Submit more pictures. The 2019 KLX450R is Kawasaki�s capable big-bore 4 stroke off-road Enduro model. The easy to handle, rider friendly, road registerable, learner legal, trail explorer, enduro racing KX derived motorcycle that has stump-pulling low down torque. Electric start and performance components combine to deliver a fast and usable total package built for the off-road. Rear suspension: New Uni-Trak with gas-charged shock absorber which features adjustable spring preload, 22-way rebound and 22-way (low speed) compression damping and 2 turns or more of high speed compression adjustment. Ask questions Join the 19 Kawasaki KLX450R discussion group or the general Kawasaki discussion group. Enter your e-mail to join the 2019 Kawasaki KLX450R forum and get notification of answers and new messages about this bike. You can unsubscribe with a single click. Bikez does not display, sell	or misuse e-mail addresses. Bikez.biz has an efficient motorcycle classifieds. Ads are free. 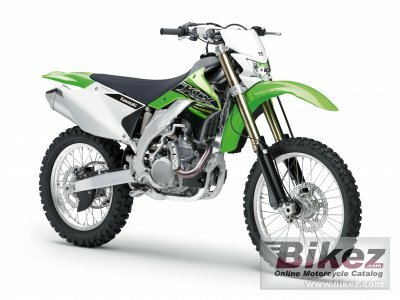 Click here to sell a used 2019 Kawasaki KLX450R or advertise any other MC for sale. You can list all 2019 Kawasaki KLX450R available and also sign up for e-mail notification when such bikes are advertised in the future. Bikez has a high number of users looking for used bikes. Before you buy this bike, you should view the list of related motorbikes Compare technical specs. Look at photos. And check out the rating of the bike's engine performance, repair costs, etc.